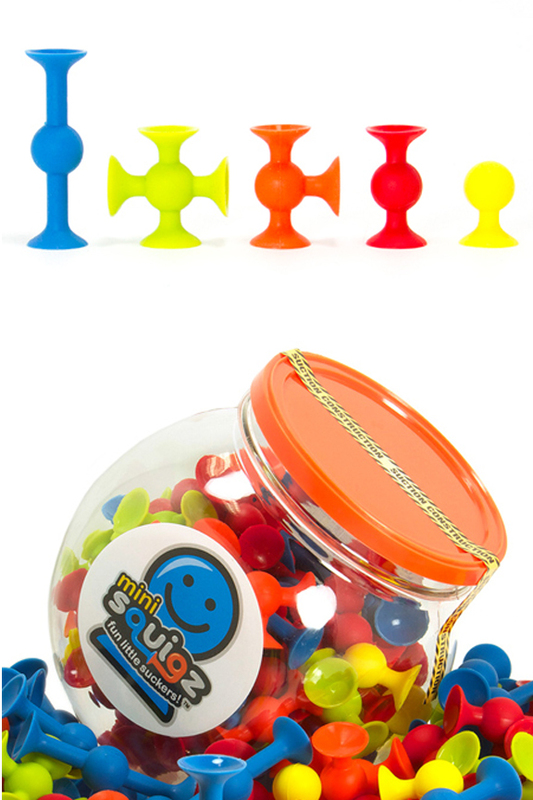 These mini size pieces guarantee big time fun. Although they're 40% smaller, they're just like the originals in every other way. The compact sizing allows for complex creations, and with 75 pieces included in each set, there's no limit to what kids can create. Build houses and forts for action figures and dolls, construct monsters and animals that walk and fly, or put together hats, necklaces and masks that can really be worn. The possibilities are limitless, and the simple, open ended construction method can be mastered by any child quickly. Simply press together and the suction cups will bond with incredible strength. Pull them apart with enough force, and they will separate with an enjoyable popping sound. Forget about rigid squares and rectangles, or hard plastic pieces. Get them thinking and experimenting as they laugh and learn while building with this toy. Each piece is made from a pure silicone material that resists wear, maintains color, and ensures a strong bond when suctioned in place. The set includes a variety of pieces, and each will have a different shape or number of suction cups. They are able to stick to each other by pressing two cups together, but they also adhere to any other smooth surface as well. Cling to mirrors, windows and walls, or secure to flat surfaces like tables and desks. From counting and sorting to building and stacking, these pieces will appeal to kids of all ages. Younger children can spend time searching to find every material they stick to, and older children can stack horizontally, off the wall, to test the limits and discover what's possible. Vibrant colors add to the appeal, and dense material ensures durability. With 5 cool shapes that are totally washable, children will have hours of fun popping and sticking to combine in a variety of ways. Despite how sticky they seem, these suckers will never leave a ring behind, or cause any damage to surfaces you stick them to. Receive 75 pieces in total when you buy this set. Take a look at the list below to see how many of each type you get. Looking for the larger, original size pieces? Then take a look at the Starter Set with 24 pieces, or the Deluxe Set with 50 pieces. We also carry Add On Sets so you can choose the shapes you prefer. For regular size Squigz with extra bendable connectors, try the Benders Set. The larger ones do play nice with these small guys as well, so mix, match and combine for a sucky situation that kids will enjoy. Simple. Easy to use, and able to stick to any smooth surface, fun is all but guaranteed. No complicated snapping or difficult connectors, just press in place to stick or connect. Educational. Let kids learn about structures, balance, design and more while they develop fine motor skills and problem solving techniques. From counting each piece, measuring the height of a tower, or discovering what surfaces they stick to, kids are sure to use their brains when playing with this toy. Washable. 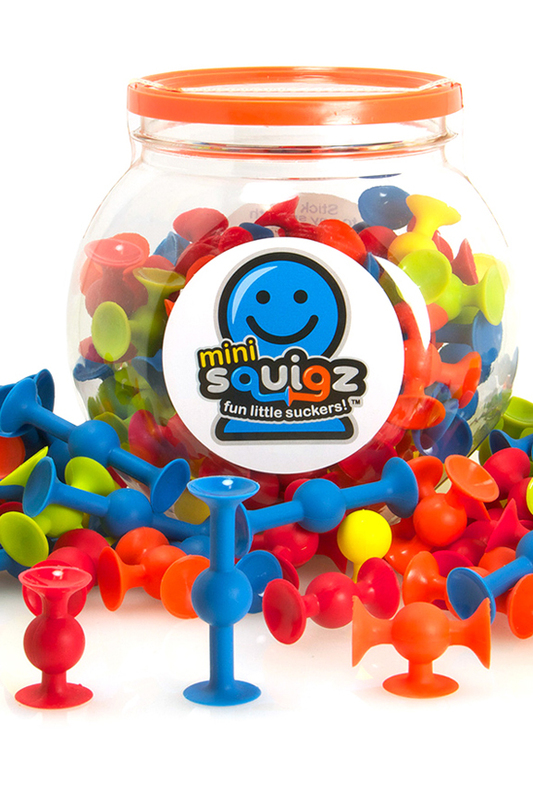 Sanitize whenever necessary because the silicone material is easily washed, and the colors will never fade. Hand wash with soap and water, or toss the set in your dishwasher to remove dirt any time you need to. Small Pieces. Almost half the size of the originals, these smaller pieces will be preferred by some, and may offer greater possibilities for older children. 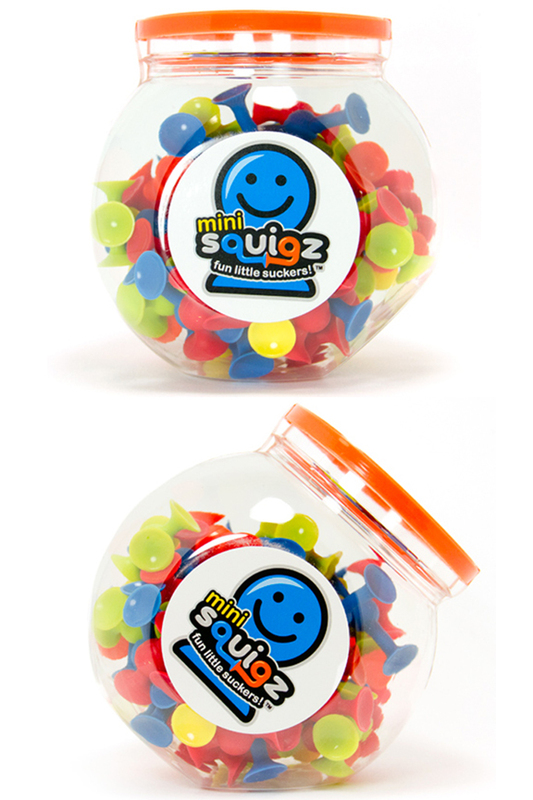 Each Mini Squig is pretty small, but still large enough for small hands to build with easily. Top Quality. No cheap plastic that breaks or wears out, and no floppy rubber that loses shape and resists sticking. Only the best silicone is used, and the pure formulation results in dense pieces that work incredibly well. They will never fade or lose shape, but they will offer hours of frustration free play. Bold. Bright colors and unique shapes make each piece stand out with it's own personality. The fun look will attract people of all ages, and keep their attentions focused longer than other options. Residue Free. There is no sticky substance that makes them connect, just a high quality suction cup. For this reason, they remove from any surface cleanly, and will never leave a mark. Versatile. Stick them together to make monsters, towers and masks, or stick them to other stuff to build up, down, left and right. Easily attach to walls, windows, lockers, mirrors and more. Uses Stick them together to build and create or pull them apart to hear them pop. Each piece adheres to any smooth surface in at least one location. For suction construction and open ended play. Color Yellow, red, blue orange and green. # Pieces 75 Total. 10 Yellow Pieces (1 suction cup), 25 Red Pieces (2 suction cups), 20 Blue Pieces (2 Extended Suction Cups), 10 Orange Pieces (3 Suction Cups), and 10 Green Pieces (4 Suction Cups). Piece Type 5 Different types. 40% smaller than the originals, but still loads of fun. Discover new possibilities, and unique building techniques with these pint sized silicone pieces. 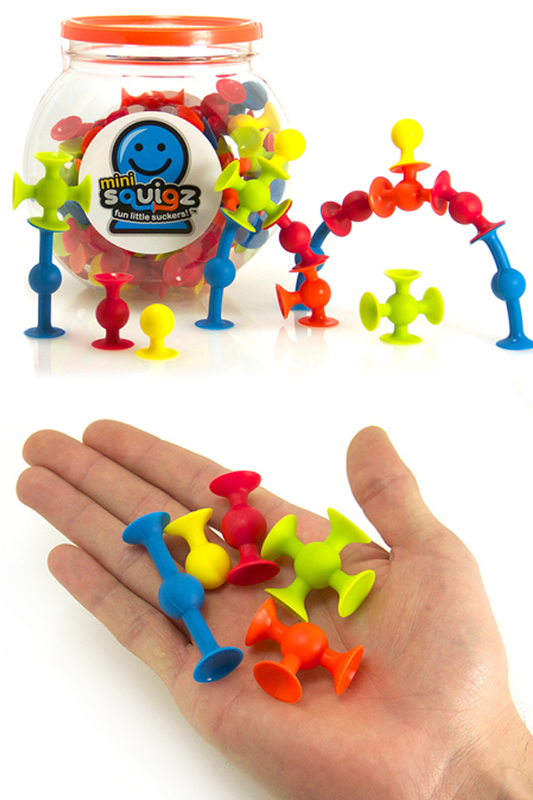 These little suckers will amuse and distract as children push them together and pull them apart, over and over again. Order Yours Today! Flip and turn to watch the propellers spin and twist. A take-anywhere sensory toy for ages 10 months and up.